When introducing transformative teaching practices involving technology, you have to be careful not to overload the senses of the tech novices on your staff. What took über geeks like me a couple of hours to master can take a life time for others. This year at my school we’ve begun to dip our toes into the waters of online communication (some staff are already swimming while others are still sitting on the edge thinking they’ll drown without support). We’ve introduced both Edmodo and blogging to varying degrees this year. Grade 6 embraced Edmodo from the start and used it in many ways, following in the footsteps of a trial program I began with some of the current teachers last year. Grade 5 came to the party a bit later and are working towards good practices with support from current teachers who were part of the trial last year. Grade 3 and 4 have recently jumped on board and are currently in the experimental stage, with some of the more tech savvy trying out more advanced features. The Grade 6s have taken to blogging this term, although more as private digital portfolios rather than true blogging with a global audience. However, class blogs have started to surface ( still limited to class member only access) and this has started to blur the lines between Edmodo and the class blogs. Our ICT Leader recently attended a network meeting and other leaders there questioned the purpose of Edmodo if they were already blogging ( until they actually investigated Edmodo – few actually knew of its existence). The point for me though is how to make a convincing argument for both Edmodo and blogging being transformative teaching and learning tools that we should be embracing. The purpose of this post then is as a reflection tool for me to consider the purposes of both platforms before selling them to the staff. 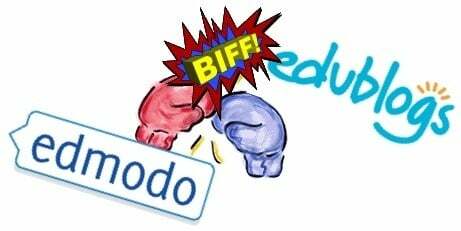 It’s also a cry out for you, the reader, to share your experiences of both Edmodo and blogging. Do you use both or tend to focus on one? In a nutshell, I see Edmodo as an all encompassing classroom management/teaching and learning/collaboration system. Blogging, on the other hand, while it can be used for all the purposes just mentioned, is a tool for writing, publishing and sharing your body of work, be it major writing tasks or quick reflections on life or school work. While it aims to share and craves feedback, blogging is a personal tool. Edmodo, however, it more group oriented. Because of the differentiation between the two, I think they should both be part of classroom practice. Collaborative Discussion – the simplicity of the Edmodo discussion wins me over compared to blogging. Simply add a note explaining the topic of the discussion, which can include images, videos, embedded links to other web tools, links to other sites, click Add and the discussion begins. All it takes is to hit the Reply button and the discussion is in full swing. The one feature I would like Edmodo to add is the ability to reply to a specific comment like you can in blogs. It can be a bit cumbersome having to write a reply to someone who wrote something 10 comments back. Assignments and Gradebook – I love this feature because it becomes a class management system. While I appreciate the ability to comment on a student’s blog, for assessment purposes you would prefer to communicate directly and privately with the student. Using the assignment feature, children can send their work directly to you for feedback and assessment. The feedback is only seen by you and the student and the child can resubmit their work as a response to your feedback. Each assignment is linked to a student’s Gradebook where a teach can store grades ( of your choosing) and comments. Folders and Tags – Tagging is an easy way to group posts around the same topic so you can access then from your tag list later on when they disappear of the front page of posts. Folders can also be set up to store specific posts on a common topic. Both tags and folders can be shared, although only the creator can add to them. Polls and Quizzes – while more advanced polls and quizzes can be created by dedicated web tools and embedded on blogs, the polls and quizzes on Edmodo can be created much more quickly, albeit only by the teacher. Quizzes can be multiple choice, written answer or fill in the blank and can be useful in collecting data for a range of subjects. Calendar – the Edmodo calendar is a effective way to help your students manage their time. Teachers can add daily events to the calendar and all assignments are automatically added as well. You can post events for specific groups as well so only those who need to see the event do. It adds or the class management capabilities of Edmodo that is simpler to use than blog calendars. I would like student’s to be able to add events, though. Library/Backpack – for teachers it’s called Library; for students it’s the Backpack. Either way, it offers a easy to use file uploading and storing system, handy, when you do work at home or school and want to continue it at the other location. Better than emailing or USB data stick. Extrinsic motivation through Badges – Not everyone’s cup of tea, but if you like to use stickers or awards, Edmodo has its own reward system called badges. You can create your own (but it’s a lot easier to just grab badges already created by other Edmodo teachers – I’ve collected 190 of them from my connections) and to encourage or acknowledge student effort or work, you can simply select their name in your class list, select a badge and award it to the students. There’s a badge made for just about anything and many come with a comment. Used wisely, it’s a good way to collate a whole bunch of comments for your student reports without doing any more work than giving that badge toa student. I’ve written a few blogposts about the benefits of blogging that you can read here if you haven’t seen them. Here’s what I think differentiates blogging from a system like Edmodo. Open/Closed Collaborative Discussion – Blogging can certainly allow for collaborative discussion and provides you with a level of control over who takes part on the conversation. If you have a public blog, anyone can take part in the conversation. If you have more rigid privacy settings, you can restrict who participates. For me, though, Edmodo is the better option for instant, collaborative discussion and feedback. With most school blogging wanting some level of moderation of comments, there is the time consuming and inconvenient need to approve every comment before it is seen by others. Edmodo, on the other hand, allows for instant posting and replying because of its secure, closed environment. Yes, popular blogging platforms allow for the set up of dedicated forums but to go through the process of setting up that, it makes more sense to put a link to Edmodo on your blog and use that as your forum. Collaborative Assignments – This is where blogs exceed Edmodo in the collaboration area. While you can share resources, have debates, and contribute to each others work collaboratively on Edmodo, blogging allows for full scale project collaboration. Individual or class blogs can give access to other users to publish work together. Users can either create their own posts or have permission to edit other users’ posts. Images, embedded web tools , videos, comments can all contribute to a shared project between two users, a whole class or even multiple classes – in your own school or worldwide. Yes you can create groups in Edmodo for different classes to share work in but it’s not as wide ranging as blogging collaboratively. Publishing and sharing work – it goes without saying that blogging is about sharing your ideas, interests, passions and work of any nature with others. Edmodo is great for sharing a link to your blog, but the work all takes place on your blog, in all the ways I’ve outlined in the other categories in this section of this blogpost. Tags and Categories – Edmodo and Blogging are very similar in this area. Tags are a great way for creating access to specific posts by using keywords related to posts. Categories allow you to group posts under subject areas. Blogging categories offer more flexibility than Edmodo folders in that you can file a single post under multiple categories. Audience – One of the benefits of Edmodo is that it is a secure, teacher controlled environment restricted to teacher control and a clearly defined set of users. This is also a drawback if you are looking for a wider, open audience. Blogging gives you both options. If you are looking for purpose for writing well, audience is important. Yes, you can keep your blog private or control who views it, but you can open it up to the whole world to share in your journey and provide you with feedback and incentive. Student bloggers get the opportunity to decide on their audience access and the level of communication they have with them. They don’t get this choice with Edmodo, which his heavy on teacher control. As a portfolio – While Edmodo has its backpack/library for no fuss, easy to access file uploading and storing, it works more as a filing system. Blogging offers more of a publishing/presentation tool feel to storing your work. It can act as an adequate word processing/publishing option with decent formatting tools, weblinks and ability to add images. It allows you to embed web tools for instant viewing of linked work, whereas Edmodo, while offering embedding, requires you to click on the embedded link to view the file ( albeit within Edmodo). Stored files on Edmodo are private ( unless shared in folders or individually posted to specific groups) whereas on a blog you can open it up for anyone ( or a limited few ) to view and comment on. I think the feature sets I’ve outlined for both platforms show a clear difference in usage but also shows how beneficial they can both be. Nevertheless, I’d like to hear from other users of Edmodo and blogging. Have I missed something that you think is important to either? Do you have uses of either that eliminates the need to use both. Please join the conversation. This entry was posted in Blogging, Edmodo, Web 2.0 and tagged authentic writing, blogging, collaboration, Edmodo, feedback, sharing, writing by mgleeson. Bookmark the permalink. I’d like the teachers to do the reflecting but time constraints haven’t allowed for it yet. This is my reflection in preparation for when the time comes. Thanks for the Affordance and Constraints chart. I did a similar thing as part of iPad proposal to leadership last year. would love to get teachers to do this next to see what they really think. This is helpful analysis of the two sites. I’m going to use Edmodo a bit more this year. Thanks for the great post Mark, I too recently wrote about this although not in nearly as much detail as you. What I find is that used well, they can really complement each other. For me is not one or the other but both blogging and edmodo. Henrietta, actually went to your blog yesterday to check something a colleague saw and noticed your post on same topic. I agree that both work well together – hope others see it that way. Thanks for your grateful students forum informations. Really helpful to read your thoughtful comments. I’m about to launch Edmodo with my 11 year olds, and spent the summer trying out blogs before deciding on edublogs. I’m thinking about each group having access to a folder of links to blogs. Is this the way to go? I want to have them blog to reflect on their learning. Hi Alistair. Not sure what you mean by the folder of links to blogs. Do you mean on Edmodo or blog? Can you explain further? Great comparison! I have recently been trying to work out this issue of overloading staff and have felt like we needed to choose one or the other at our high school despite my belief that there is a place for both. A number of us are currently using Edmodo; we love it and so do our students! But I’ve decided to tackle the blogging scene by having our yr 12s create them for their major research projects! Looking forward to reading your other posts re blogging to help me out! Ps love the communities in Edmodo, I have gotten some wonderful resources from great teachers! And of course parents love the ability to see the gradebook and calendar! Good to hear about your Edmodo success, Gabriella. Obviously you have the parents on board with it. Hopefully your school will see the benefits of blogging in sharing the students work with parents too. Thank you for the post. I have just entered into the world of Edmodo and I love it! As a grade two teacher I have used blogs for the purpose of showing their learning as a digital portfolio. I definitely see the benefit of using both in the classroom and when I go back to the classroom that is definitely what I will do! Do you have more insight on this 2 years later? I use Edmodo in my classes and am using one for our preparation for an International student trip to Nepal. I am asking the students to journal every day while we are there but I would also like them to share with each other. What would you recommend to do that? I would like them to be able to share their experiences but also maybe their favorite photos of the day. I would like others to comment on their posts as well.